Buttery and sweet gluten free shortbread cookies are a irresistible dessert. 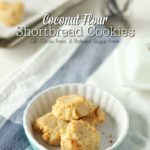 Simple and delicious coconut flour shortbread cookies with a delicate, sweet, and buttery flavor without gluten, grains, or refined sugar. For this recipe you will need: butter, coconut flour, maple syrup, salt, egg, and vanilla extract. 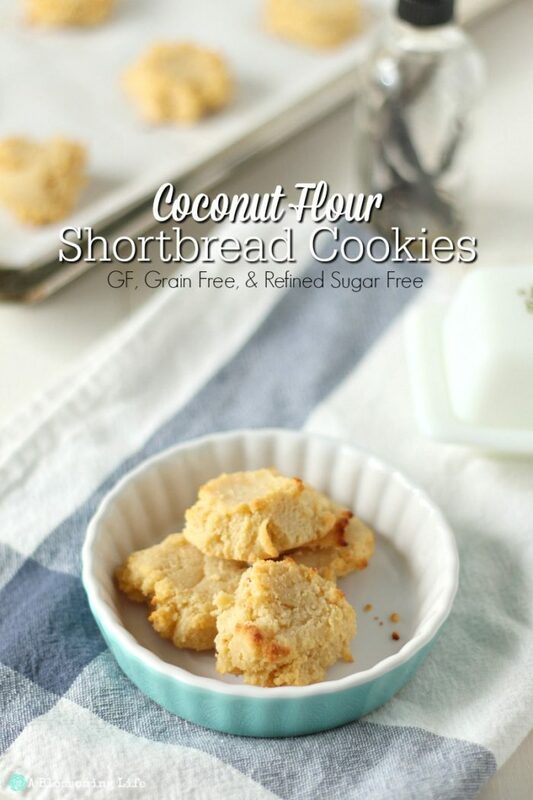 Ohhh, man… are these coconut flour shortbread cookies good. So good, in fact, that the whole batch was gone within the day. I swear I didn’t eat most of them…. okay, I did. I needed to make sure they were really delicious to share with all of you. Obviously. My husband swears he only ate one (I don’t believe him), and my toddler had two. Doing the math here, that means I ate nine. Oh my goodness… how embarrassing! See this is why we never keep treats around the house. Zero will power here folks. 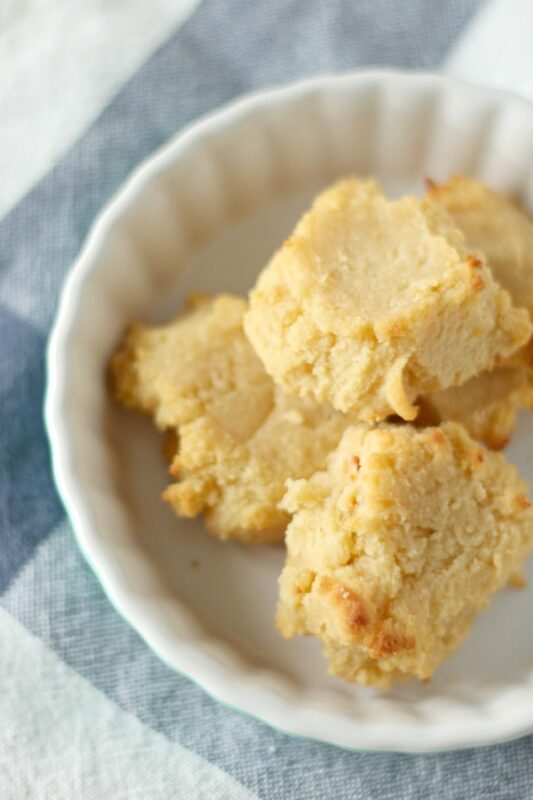 These coconut flour shortbread cookies are buttery, moist, and really delicious. The cookies hold together well, and they tasted like the buttery shortbread cookies y’all are used to – without the refined sugar and gluten. Nom nom nom. Nine cookies later, I would say I did just that. Dealing with food sensitives during the holidays. My daughter loved them. She also showed she still has a sensitivity to eggs. I was really hoping she would be over it by now, and we test it from time to time. “Cookie” is one of her favorite words at the moment. Not sure why, since she never gets cookies… Personally, I think my husband is trying to plant little cookie seeds in her so I make them… it worked this time. I figured it would be fun to treat her to one of these bad boys. Some spit up later… I hope it tasted as good on the way up as it did on the way down… hahaha… that was really gross. Sorry. 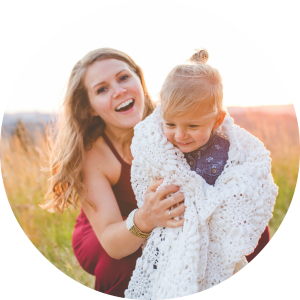 When Christmas rolls around, it can be difficult for those with food sensitivities, especially gluten sensitivies. They either feel left out or deprived, because they are going to parties where they can’t devour a bunch of cookies, or they are are like me and eat the things they are not supposed to and suffer the consequences later! Well, now you don’t have to! You can indulge without the backlash. These already delicious cookies were transformed into these Gluten Free Peppermint Fudge Cookie Bars! Line your baking sheets with parchment paper so they don’t stick. Sift the coconut flour to make sure there are no lumps. Use two spoons to drop cookies onto cookie sheets or use a tiny ice scream scoop. Coconut flour can be tricky and different brands may yield different results. So you may have to adjust the amount of coconut flour you use. If you are dairy free, you can probably use a substitute like coconut oil or palm shortening, but I haven’t tried it myself. Cookie sheet (I use stainless steel ones similar to these), stand mixer or hand mixer (I have this one), silicon spatula, and parchment paper. Place parchment paper on cookie sheet and preheat oven to 350 degrees. Add softened butter to a stand mixer and add maple syrup and vanilla on low-medium until well combined. Add in egg and mix. With the mixer on low, slowly add in coconut flour and dash of salt. Scrape sides of bowl and mix until coconut flour is completely combined. Make 12 cookies by spooning dough onto cookie sheets. 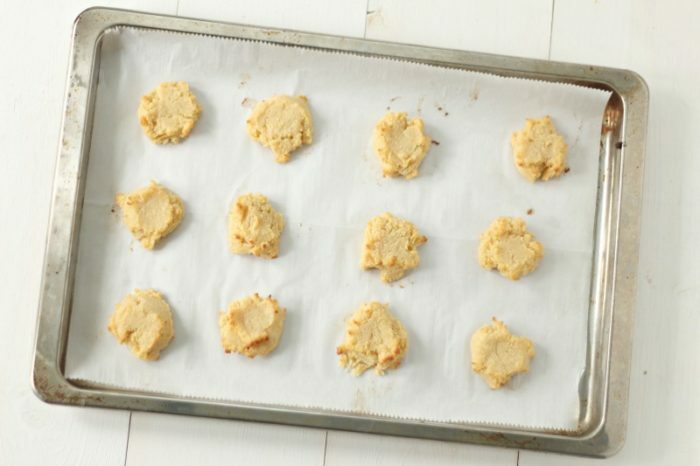 Bake coconut flour shortbread cookies for 12-15 minutes until cookies begin to brown. Peppermint Fudge Shortbread Cookie Bars take this recipe to a new level. Vegan Fudge is a staple in our house. So yummy. Or how about the best ever Chocolate Whipped Cream? Simple and delicious gluten free shortbread cookies are made with coconut flour and have a delicate, sweet, and buttery flavor without gluten, grains, or refined sugar. Preheat oven to 350. Place parchment paper on cookie sheet. Add softened butter to a stand mixer and add maple syrup and vanilla on low-medium until well combined. Add in egg and combine. With the mixer on low, slowly add in coconut flour and dash of salt. Scrape sides of bowl and mix until coconut flour is completely combined. Spoon dough onto cookie sheets, making 12 similar-sized cookies. Bake for 12-15 minutes until cookies begin to brown.